Only a few weeks old – but working very professionally: We are talking about the initiative train of hope, helping since summer 2015 on the Vienna central station – one of the most important places in Austria in terms of the current refugee support. In all the hustle (cooking meals etc.) great importance is also attached to hand hygiene. With Mrs. Martina Barwitzki from the organisation team spoke Carola Timmel. Mrs. Barwitzki, some days ago I had the possibility to go inside the train of hope-zone and I was very impressed by the people’s engagement. 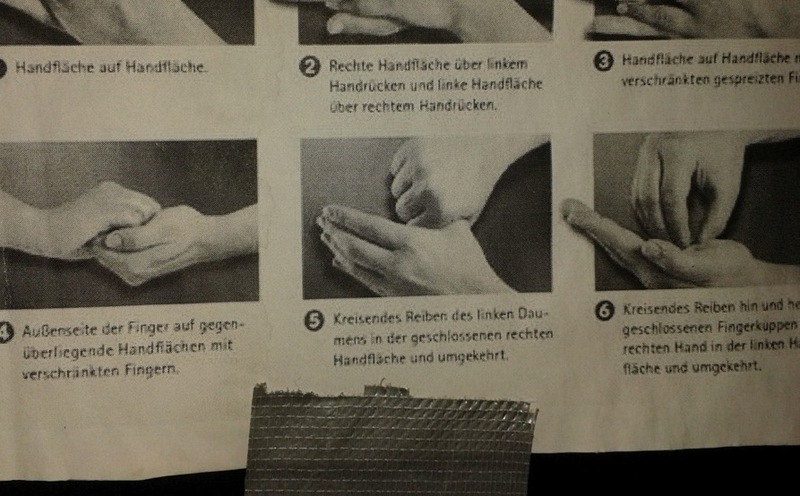 There was a sheet at the office entrance (see photo above) with hand disinfection instructions. This is remarkable as everything is very improvised, and your worries probably rather apply to more important things than to hand hygiene. Thank you for this compliment. This has not been like this from the very first beginning. But quite rapidly the volunteer helpers from the medical community informed us about the importance of hand hygiene. For most of us, who have no medical background, this was completely new. Not at all. We see it as our duty to educate all workers about health risks in our environment. We want to help, but we want to keep the risk to a minimum. That’s why every volunteer gets a brief education about health risks and hand hygiene when he/she starts working. One disinfection per hour is recommended. Do you check whether the people really do it? There is no time to verify whether every person adhere to this recommendation, but we regularly remind the people to disinfect their hands and we regularly distribute disinfectants. And what’s about the refugees and hand disinfection? We also animate them to wash their hands – of course. On your website there is a blog, where you post the things that are needed at the moment – for example bred, feta-cheese, warm clothes, hygiene articles. What else is needed? Train of hope: Is an independent association of volunteers coordinating voluntarily emergency aid for refugees at the Vienna Central Station. ECDC: Migrants entering Europe are in general healthy and are not bringing new... Carola Timmel Carola Timmel Refugees: which medical challenges we have to face?